Thankfully the last few days have been much better than our day on Monday! :-) Here are a few pictures from July 23. 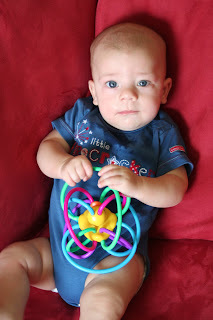 Mason is now holding toys, and EVERYTHING is going right to the MOUTH! 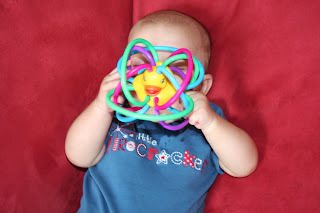 Grant still loves to play with Mason's toys and finds himself stuck in various toys unable to get out. He sure loves to climb! 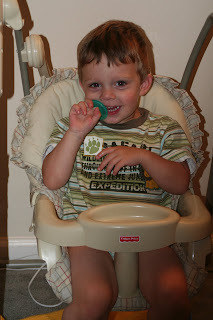 Every now and then we'll even find him with Mason's paci in his mouth. Yuck! I put the boys down for a nap today. Mason was already sleeping when I laid Grant down. I had told him Mason was sleeping so he had to be extra quiet so he wouldn't wake him. Things were extremely quiet for a while, then I heard a strange sound...like both boys were laughing. 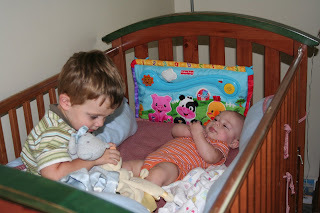 So I went in to see what was going on, and found Grant in the crib with Mason. Mason had rolled over onto his back and was watching Grant intently. Both of them were playing with a little toy we have on the side of the crib and they were having a ball! It was cute. I hated to move Grant back to his own bed, but, afterall, it was naptime! They did eventually go to sleep, thank goodness. Hey...that's one of the Christmas presents I bought for Mason isn't it? It looks like the boys were having fun - makes me nostalgic of jason crawling in your crib and entertaining you by the hour!